As promised in my last post, here is the rest of what happened in May. This year I decided that I wanted to get back climbing outdoors again, there's nothing like getting out on rock, rather than pulling on plastic in a climbing wall, also the skills would be useful for future climbing trips to the Alps. I felt that my outdoor climbing skills were a bit rusty and could do with a bit of a refresher. 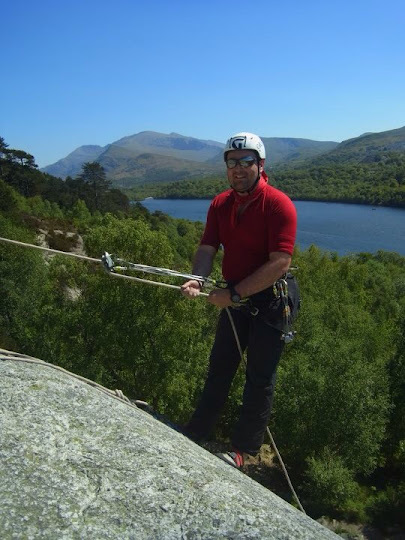 After a bit of research on the internet, I decided that I would go to Snowdonia (Llanberis), as this area could offer me many different styles of climbing on different rock, from big hills days, scrambling and multi-pitch rock climbing. I found a local company "The Rock Climbing Company" which offered everything I wanted, so I hired a guide for a bit of one to one instruction/guiding. My guide for the 3 days was Sam Leary, she was a great teacher, very patient and encouraging. At the start of the first day, Sam and I discussed what I wanted to achieve during the next few days. Unusually for Snowdonia, the weather forecast for the week was stunning, hot and DRY!!! This meant that we could go and do virtually anything we wanted. 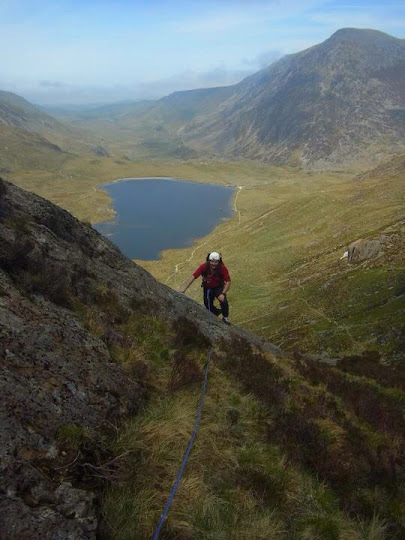 We opted to go to the Ogwen Valley/Cwm Idwal and do some classic easy climbing on the Idwal Slabs, it was a chance for Sam to see how I climbed and assess what skills I already had and what needed improving. After a short walk in we put on harnesses, rock shoes and roped up. As most of the other easy routes in the slabs were already taken we were left with the route called "Faith" a classic 130m, 5 pitch climb, beginners climb. This all went well, Sam led the pitches and I followed. I got to practice constructing belays and placing climbing protection. At the top of the climb we replaced our climbing shoes with ridged soled walking boots and we continued by scrambling up even higher to the top of the ominously named "Suicide Wall". From here we climbed into the "Nameless Cwm", where the next objective came into view, the "Cneifion Arête". The Arête itself, looks like a ship's prow sticking out of the mountain and is a classic Grade 3 scramble/moderate rock climb that extends for 130m to the top of Y Gribin. The first couple of pitches were the main crux of the climb, but in big boots you loose all sensitivity, after a bit of thrutching & grunting I made it passed the initial obstacles onto easier ground. Nearing the top of the climb the drop to the right is huge, this has always been something that's frightened me, but this time I surprised myself as I seemed to handle this OK. We made it to the top, the sun was still shining, and we were above the clouds in the valley. We headed down to the valley, by this time I was getting tired, it had been a long first day. I went back to my B&B for a well earned rest and an early night. As the first day was quite a long one, I decided that I wanted a shorter day, so we decided to go rock climbing, to get some more practice on placing gear and building belays. We originally decided to go to the Llanberis Pass (one of the climbing Meccas in the UK). However, on arrival, the walls all looked a bit daunting and steep for me, Sam sensed this, so we drove the Molewyns, near Blaenau Ffestiniog. From the car park we walked the short distance up to the crag (Clogwyn yr Oen), a much friendlier venue to practice climbing skills. We had the whole place to ourselves, the sun was already beating down and the rock was warm to the touch. Nice! We climbed a 4 pitch route called "Slick". The rock was super grippy and the climbing was not that difficult, apart from the third pitch which seemed like a blank, featureless slab. This required me to trust my feet on tiny pockets in the rock as there were very few hand holds. Again it was good to practice all the skills in a different environment and with Sam's expert instruction I picked up loads of tips to make things easier in future. In the afternoon we climbed up another route, by this time it was getting really hot, which was making me tired. We took this opportunity to practice another skill. Abseiling. This is something I'm not overly confident with, I find it quite unnatural and it scares the life out of me! We rigged an abseil and with some gentle coaxing I made it to the ground, in one piece. We returned to Llanberis for a well deserved ice cream from Georgio's and to discuss what additional bits of equipment I needed for climbing. We also planned our final day. The final day, we had originally decided to do a classic rock climb (Grooved Arête) high on the East Face of Tryfan. However, after a bit of a slog up Tryfan, I was feeling a bit ropey (no pun intended). I put this down to slight dehydration and tiredness from the previous two days adventures. I'm pretty honest with myself and know when to "throw in the towel", also I thought it would be best to let Sam know sooner rather than later as this could have led to bigger issues higher up on the climb. We descended and readjusted our plans and went to do some easy climbing on Tryfan Bach. There were many routes to choose from all of an easy grade. Near the top Sam asked if I wanted to lead the final pitch, which I accepted. We then practiced some alpine climbing skills, such as taking in coils of rope, moving together and body belaying, all very useful for the Alps. In the afternoon we moved to a different crag just outside Llanberis called Lion Rock. This is a area that is used by climbing groups, schools, Scouts, etc to practice climbing and abseiling. The main reason for going here was not for the climbing (as it was quite easy) but to practice rigging abseils and top ropes. Sam had asked me to use all my skills to build anchors and rig the top ropes or abseil ropes, all with minimal input from her. The proof of the pudding is in the eating they say and with that I was climbing and abseiling off my own anchors, I was slightly worried at first, but as I'm writing this blog all went well and the anchors stayed put! After these 3 intensive days I feel that I'm more confident and now have the skills to go and climb outdoors. Thanks to Sam Leary (my guide/instructor) and The Rock Climbing Company. I would recommend these guys to anyone who wanted to learn to climb, move from indoor to outdoors climbing or like me brush up on some skills and gain a bit of confidence. I rewarded myself that night with a big juicy steak and a pint or two at my B&B. As a warm up to my trip around Mont Blanc at the end of June, myself, Phil my walking companion and another old work colleague, Anthony decided to enter the Hawkdean Hike to get some miles under our belts. This is well organised hike in South Gloucestershire that has various lengths 10, 20, 30 or 40km. For better of for worse we decided to go for it and do the 40km. The only stipulation is that it has to be completed in 10 hours. Easy we thought. The day started well, as most of the route was in Phil's back garden and the weather looked good for the whole day. We set off with a spring in our step at 7:30 in the morning, the sun was already warm and the day was only going to get hotter. The walking initially, was pleasant enough over relatively flat farmland, quiet lanes and through woods, then we hit the hill leading up to the Somerset Monument near Hawksbury Upton, this was a long old slog in searing heat. The only good news that this signified half way and lunch time, always a good morale booster. Setting off again it was all down hill and psychologically we were heading for home, we passed through many lovely villages and saw things I didn't know even existed, considering I have lived in this area for over 12 years. Then on the approach to Chipping Sodbury we all hit the "wall". I had to tend to my feet, as I was starting to get a blister, whilst Phil and Anthony went for a morale boosting ice cream which Anthony wanted since about the third mile. Anthony and I had to perform running repairs to our feet. I'm sure he should be sponsored by Compeed or Elastoplast. As we ticked down the final miles, we all got into a groove which we felt comfortable with, each step becoming more and more difficult. Finally, we entered the last field, back to the starting point. We had completed the hike in 9 hours 15 minutes. A great achievement by all. I finished with 1 blister, 2 achy feet, slight cramp in one calf and a sense of achievement. Don't trust Phil to enter us into the hike. Phil has a pathological fear of cows! Anthony gets the biggest blisters I've ever seen. So as you can see from the last two posts, May has been quite eventful. Onwards and upwards with June!